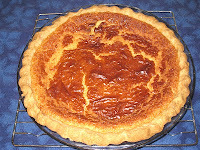 Buttermilk pie is popular in the South, especially in Texas. It is similar to chess pie; the main difference being that the vinegar is replaced with buttermilk. There are as many variations for this pie as well. When I first decided to make buttermilk pie and started looking up recipes, one thing I saw over and over was how sweet it was. I even found a recipe that had a less sweet alternative. With all of those warnings, I decided it might be wise to start with the less sweet version. To make the less sweet version, according to the recipe I chose, you simply add an egg and half a cup of buttermilk. Since nothing was removed, it was a lot of filling for my standard 9-inch pie crust. I might have cooked it a little too long because I was worried that it might not set, but it was also slightly curdled in texture, and not at all smooth like it should have been. And it was not sweet. Hardly at all. So I decided to bite the bullet and make the sweeter version. It came out smooth and silky. And it was sweet, yes. But not terribly sweet. 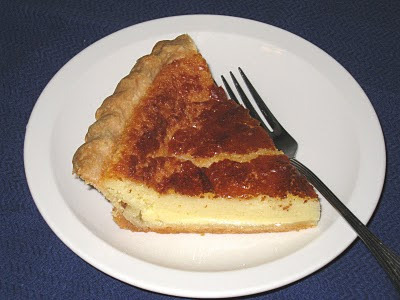 All I can say is this: Anyone who thinks that buttermilk pie is too sweet hasn't tasted chess pie. It's not nearly as sweet as that. It's a good pie. The buttermilk adds a slightly tart creaminess to counterbalance the sweetness. I will most likely make it again. But not nearly as often as I will make the tooth-achingly sweet chess pie. Put sugar and flour into a small bowl and whisk together. Beat eggs lightly. Add the sugar and flour and the melted butter and mix well with a whisk or a large wooden spoon. Add the buttermilk and the vanilla and whisk it in. Dust the unbaked pie shell with a scant teaspoon of flour. Pour the batter into the shell. Sprinkle another scant teaspoon of flour on top. Bake for about one hour, until a knife inserted into the custard comes out clean. adapted from Country Cooking, by the editors of Southern Living magazine (Galahad Books, 1974), as related by Natalie Y. Moore in this NPR article.